This week, Stephen Ibaraki has an exclusive interview with Mattias Ulbrich. Mattias Ulbrich was born in Braunschweig in 1966. After studying Electrical Engineering at Braunschweig Technical University, Ulbrich began his career in the Sales division of American IT company Hewlett Packard in 1993. 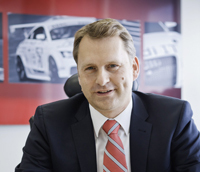 Ulbrich joined AUDI AG in 1998. Until 2003, he worked at the Neckarsulm site, where he was latterly in charge of the Information Systems – Product Manufacturing Department. Ulbrich was subsequently appointed Chief Information Officer at SEAT in Barcelona where he was responsible for IT, Organization and Systems over a period of three years. After joining Volkswagen in Wolfsburg in 2006, Ulbrich held several managerial roles in IT, ultimately heading up the ITP Customer Order Process department. Mattias Ulbrich has been Head of IT and Organization at AUDI AG since February 1, 2012.
:00:34: What specific attributes produce the EU CIO of the Year? "....For me (in the digital area), interdisciplinary collaboration is key to success. The best ideas for active shaping of rapid transformation are created in teams. The IT department is well connected to all business areas and supports the business needs. We see ourselves as an enabler and I think this is very important...."
:02:10: In what specific ways will machine learning and deep learning progress your industry? "....Machine learning is a very important thing, especially in the future. For example, pilot driving (which we showed in the CES 2015) where we drove a car from the Silicon Valley in California to Las Vegas)....We use machine learning and data analytics to prevent any failures; that means looking at preventive maintenance and where we can learn from the data to avoid any failures as well as any quality issues that would affect our cars...."
:03:44: What specific future technologies will impact your industry and in what ways in five years? "....Beneath what just we talked about (machine learning), we believe the Internet of Things will be a very important thing. The Internet of Things will connect a lot with the car. Right now you have a lot of buttons in the car to have a machine interface, but in the future you will have even more things done with speech control in the car and we will simplify the car design in this interface as well...."
:05:09: How is manufacturing being transformed in the next five years? "....We believe, especially in manufacturing, we will see a lot of changes. In the past, we already did a lot of things within the production process to improve the efficiency and the quality of the cars....One very important thing is that we use more and more robotic assistance in this smart factory....Another thing is we are using step-by-step even more virtual reality and augmented reality to support our people in the production site...."
:06:54: Can you talk more about the joint company you formed with the marketing organization and how this is a model for the future for collaboration? "....I think that interdisciplinary teams are very crucial for the success in the future, especially to create innovation on the technology part, as well on the business part. We decided to create a company located in Munich together with our colleagues from Sales and Marketing, and we formed IT to bring teams together that are really focused on creating new solutions for our customers based on new technology that you know from digitization. We are doing everything on the mobile platform to bring mobility solutions to our customers...."
:08:20: What are some new business models where the IT organization is the foundation driving innovation and new revenue? "....In the past we just sold or leased cars, so we are looking for new business models to support mobility for our customers.....For example, we have Audi on Demand (available in San Francisco) and the customer can choose from an exclusive Audi fleet a car that they'd would like to use. A concierge will personally deliver and pick up the Audi on Demand vehicle without any additional costs and everything that is done (reserve, unlock and enables the driving) is done by your phone. This is one example where we as IT really supported this solution...."
:10:57: What are key lessons for other IT executives? "....We believe that team building is very important and that we have a flexible organization and a collaboration model with a business area which is looking for the common objective, and use Agile methodology to find the best IT solution.....You need the right employees with the right behavior and right attitude to really focus on the objective and also have the right competencies in place to find the best solution...."
:12:08: Can you share any stories of "impossible" challenges you were able to master and maybe some lessons from it? "....To really find solutions for "impossible" challenges (as you call it) you need a really good team. I think this is the best way to find the solution. I have some of those stories in my career. The last one was when I started here at Audi three years ago. We really had a challenge because we delivered this platform for the cars and we had to adapt the website car development cycle and the IT development cycle (this was a totally different then). We did that two years ago and it went very smooth, but at the starting point we had a lot of discussions and it was not that easy to find a common way...."
:15:05: Are there lessons that you can summarize from the last question? "....The most important thing is the team....You need a very clear common objective....You need a sense of urgency that this objective is the most important thing to do right now....You need to be open for other ideas and be creative to find the best solution....The best is done if you listen to the team and you are really open to all ideas that are coming up...."
:15:52: In your current role, what are your top resources? "....My top resources are my management team and as well as my boss. I think it's very important to have such a team and a very good supportive boss on your side....My colleagues from the business areas are very progressive and good resources to find the best solutions....And last but not least is my family. I get a lot of support from my wife, but as well from my children. Those are the right people to speak to you to get the ideas of what the younger generation thinks about mobility, for example, and how to use IT in the right manner so that is a helpful resource for me...."
:17:15: As a successful senior technology executive, what are your best leadership lessons that can be used by executives? "....It's all about people. Of course technology is also important, but technology is not the crucial point and you need to look for the solution that is needed by the people...."
"....Yes, I believe that it's a very important thing because if you look at the future, people are depending more and more on good IT solutions, so I think it would be good if IT would have a code of ethics...."
:20:09: From your extensive speaking, travels, and work, can you share some stories (perhaps something amusing, surprising, unexpected, amazing)? "....I was invited to a German Octoberfest and it was very interesting to see that you can drink Bavarian beer and German beer and eat sushi at the same time. That was a very special situation and I hadn't heard about that before, that you would have an Octoberfest in Japan...."
:22:32: If you were conducting this interview, what kinds of questions would you ask and then what would be your answers? "....You are an IT guy, why would you work for Audi?....Where in the world does Audi have people working for us?....What kind of car do you drive right now?...." :25:04: Mattias, with your demanding schedule, we are indeed fortunate to have you come in to do this interview. Thank you for sharing your substantial wisdom with our audience.